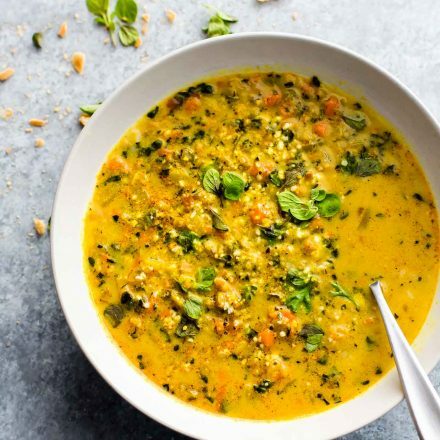 Curried Cauliflower Rice Kale Soup is an easy paleo soup recipe and nutritious meal-in-a-bowl. Roasted curried cauliflower “rice” with kale and even more veggies to fill your bowl! A delicious vegetarian soup to make again again! Vegan and Whole30 friendly! 5–6 cups of cauliflower florets (about 3–4 cups when “riced’). See notes. In a small bowl, toss your cauliflower florets with the curry powder, garlic powder, cumin, paprika, salt, and 3 tbsp oil. Spread the cauliflower florets on a baking dish or roasting pan. Place in oven and roast for 20 -22 minutes until tender but not overcooked. slightly under cooked. While the cauliflower is cooling, prep the rest of your veggies but chopping them up on cutting board. Next place cauliflower florets in a Food Processor or blender and pulse a few times until the cauliflower is chopped or “riced.” See picture in post. Bring to a quick boil (make sure milk does get too hot), then simmer for another 20 minutes or so until veggies are all cooked. .
Garnish with herbs and nut/seed crackers crumbles..
Feel free to use other veggies besides kale and carrots. All work great. I found that almond milk works great in this recipe. Keeps it light and smooth. Cashew and coconut milk work as well. If you are not paleo or vegan, you can add other toppings such as crackers, nuts, cheese, etc. You can also add in cooked chicken or meat.